New from DDM! This new Dominator pipe was developed through months of extensive in-house testing and prototyping, and custom-designed for maximum performance.This new Dominator pipe for your Losi 5ive will give you the power you crave! Gives snappy low-end response, as well as huge power boosts through the midrange, and top RPMs. The DDM Dominator pipe features top-quality steel alloy construction, flexible header coupling, ultra-sturdy adjustable mounting system, and jaw-dropping high polish show chrome finish. Includes genuine Zenoah exhaust gasket, installation instructions, and mounting hardware. In addition to incredible performance and appearance, this pipe boasts a rock-solid mounting system, ensuring your pipe will be well-protected. Installs and removes quickly and easily for ease of use. Separate header piece allows for quicker removal, while also allowing for fitment adjustment. A pre-bent silicone exhaust tube connects to the end of the pipe, and flows the exhaust out the side of the vehicle. 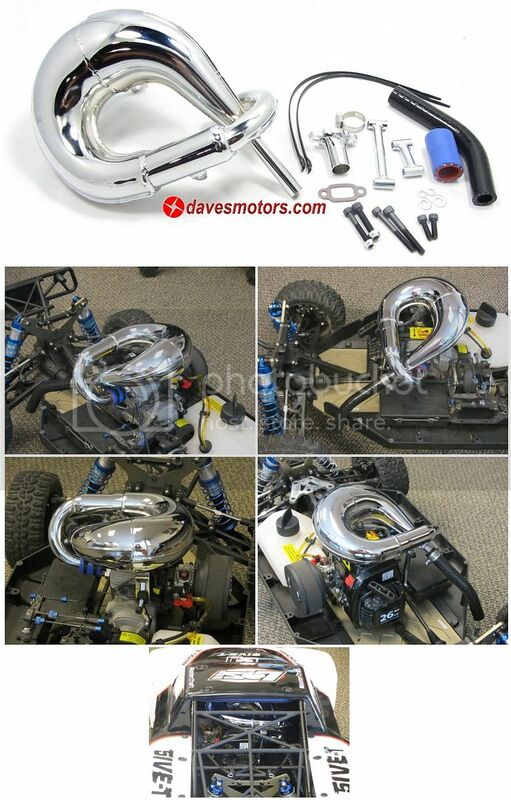 The mounting design of this pipe keeps engine removal from your chassis a breeze. The pipe is mounted completely to the engine so removal and maintenance is just as easy as before. As the Losi is 4WD and heavy, it is underpowered in the area of low end torque. In designing this pipe, we focused primarily on this area. It is a beast on low end, and results in significant top end gains as well. This pipe keeps its weight centered over the engine and the center of the car - so you don't have to deal with the car being unevenly weighted to the side or rear. When the roll cage/body are put back onto the truck, there is still plenty of clearance and room to spare. Access to the pull starter remains unrestricted.